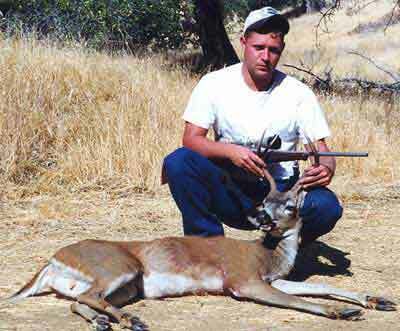 James Marion of Santa Rosa, California shows off his A Zone blacktail buck. 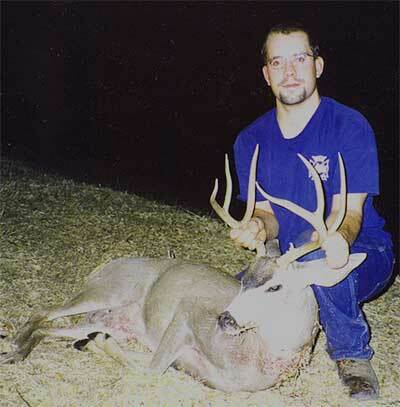 James took this forkhorn on 9/5/99 using his new Winchester Model 70 in .30-06. The buck was 80 yards away. This nice 3-pointer was taken by Paul Chapman of Antioch, California. Paul was working on his deer camp when he spotted the buck chasing a doe. Paul quickly picked up his new 300 Winchester Mag. The buck was 100 yards away when Paul dropped him. It was 9/17/99 in the A Zone.